Female pelvic anatomy can be a conceptual challenge. To understand the function of the pelvis, one must understand the basic anatomy and then the dynamic nature of the structures that allow for urinary and bowel continence in a variety of circumstances. An understanding of normal anatomy and function provides the clinician with a framework for understanding the pathophysiology of pelvic organ prolapse and female urinary incontinence. The evaluation of female urinary incontinence often involves the recognition and treatment of concurrent pelvic abnormalities, such as cystocele, uterine prolapse, enterocele, rectocele, or perineal laxity. The factors responsible for pelvic floor relaxation rarely affect isolated anatomic areas. 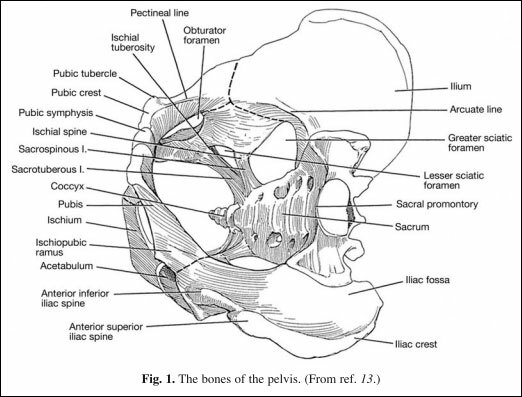 This chapter provides a detailed description of normal female pelvic anatomy, and an emphasis is placed on key surgical landmarks for reestablishing normal anatomy. The bony pelvis is comprised of the sacrum, coccyx, and two innominate bones, formed by the fusion of the iliac, ischial, and pubic bones (Fig. 1) (1). An opening is found between the pubic and ischial bones, medial to the acetabulum, known as the obturator foramen. The ischiopubic ramus is the medial fusion of the pubic and ischial bones. Transobturator devices used during antiincontinence procedures are passed around the midpoint of this structure through the obturator foramen. The pectineal line on the anteromedial aspect of the pubic bone is an important surgical landmark for retropubic urethral suspensions (Fig. 2). The supporting sutures are often placed in Cooper’s (pectineal) ligament, which overlies the pectineal line (1). The pelvic floor is diamond shaped, with the pubic symphysis anteriorly, the sacrum posteriorly, and the ischial spines laterally as its apices. These structures provide the main anchoring points for the supporting structures of the pelvic floor (2). The sacrospinous ligaments (SSLs) span the posterior aspect of the pelvic floor from the ischial spines to the anterolateral aspect of the sacrum and coccyx, creating the greater and lesser sciatic foramina (Fig. 1). Fig. 2. 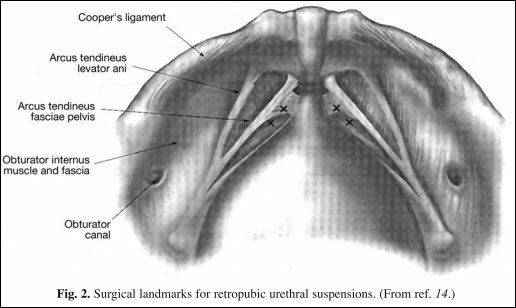 Surgical landmarks for retropubic urethral suspensions. (From ref. 14.) The SSLs are instrumental in many prolapse repair techniques. Medially, the SSL fuses with the sacrotuberous ligament, and together they serve to stabilize the sacroiliac joint (3). Brooks JD. Anatomy of the lower urinary tract and male genitalia. In: Campbell’s Urology, 8th ed. (Walsh PC, Retik AB, Vaughan ED, Wein AJ, eds. ), Saunders, Philadelphia, 2002;41-80. Klutke CG, Siegel CL. Functional female pelvic anatomy. Urol Clin North Am 1995;22:487-498. De Lancey JO. Surgical anatomy of the female pelvis. In: Te Linde’s Operative Gynecology, 9th ed. (Rock JA, Jones HW, eds. ), Lippincott, Williams, and Wilkins, Philadelphia, 2003;63-93. 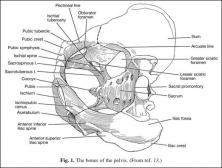 Strohbehn K. Normal pelvic floor anatomy. Obstet Gynecol Clin North Am 1998;25:683-705. Whiteside JL, Walters MD. Anatomy of the obturator region: relations to a trans-obturator sling. Int Urogynecol J 2004;15:223-226. Bartsch G, Strasser H, Poisel S. Surgical anatomy of the genitourinary system. In: Adult and Pediatric Urology, 4th ed. (Gillenwater JY, Grayhack JT, Howards SS, Mitchell ME, eds. ), Lippincott, Williams, and Wilkins, Philadelphia, 2002;3-46. Wahle G, Young G, Raz S. Anatomy and pathophysiology of pelvic support. In: Female Urology, 2nd ed. (Raz S, ed. ), Saunders, Philadelphia, 1996;57-72. Kabalin J. Surgical anatomy of the retroperitoneum, kidneys and ureter. In: Campbell’s Urology, 8th ed. (Walsh PC, Retik AB, Vaughan ED, Wein AJ, eds. ), Saunders, Philadelphia, 2002;3-40. Chancellor M, Yoshimura N. Physiology and pharmacology of the bladder and urethra. In: Campbell’s Urology, 8th ed. (Walsh PC, Retik AB, Vaughan ED, Wein AJ, eds. ), Saunders, Philadelphia, 2002; 831-886. Stothers L, Chopra A, Raz S. Vesicovaginal fistula. In: Female Urology, 2nd ed. (Raz S, ed. ), Saunders, Philadelphia, 1996;490-506. Richardson AC. The rectovaginal septum revisited: its relationship to rectocele and its importance to rectocele repair. Clin Obstet Gynecol 1993;36:976-983. DeLancey JO. The hidden epidemic of pelvic floor dysfunction: achievable goals for improved prevention and treatment. Am J Obstet Gynecol 2005;192:1488-1495. Hinman F Jr. Atlas of Urosurgical Anatomy, Saunders, Philadelphia, 1993. Paraiso MFR, Falcone T. Laparoscopic surgery for genuine stress incontinence and pelvic organ prolapse. In: Urogynecology and Reconstructive Pelvic Surgery (Walters MD, Karram MM, eds. ), Mosby-Yearbook, St. Louis, MO, 1999, p. 199:213-226. Raz S, Little NA, Juma S. Female urology. In: Campbell’s Urology, 6th ed. (Walsh PC, Retik AB, Stamey TA, Vaughan ED Jr, eds. ), Saunders, Philadelphia, 1992, p. 2783:2782-2828. Netter FH. Atlas of Human Anatomy. Icon Learning Systems, Teterboro, NJ, 2003. Benson JT, Walters MD. Neurophysiology of the lower urinary tract. In: Urogynecology and Reconstructive Pelvic Surgery (Walters MD, Karram MM, eds. ), Mosby-Yearbook, St. Louis, MO, 1999;31-43.